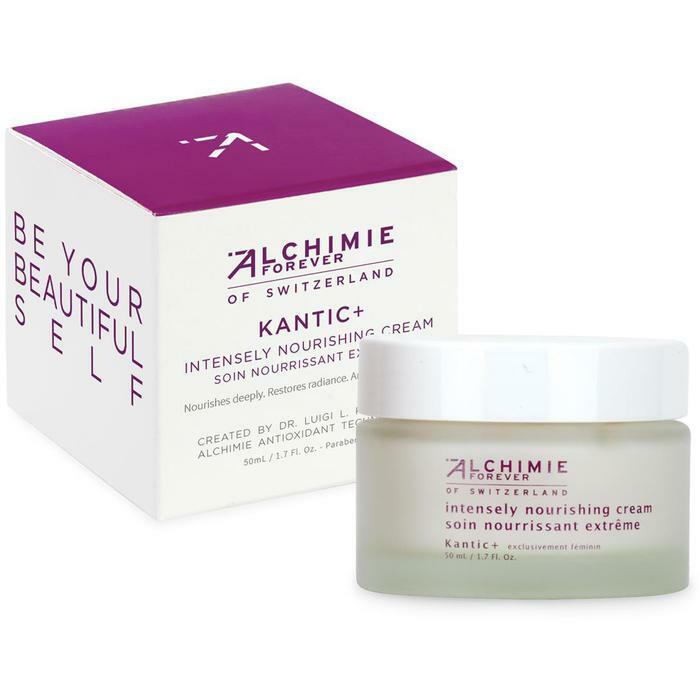 Kantic+ Intensely Nourishing Cream - Remarkable. Dream skin. Alchimie Forever founder's favorite product. Total nourishment. Rich in emollients such as jojoba and vitamin E, this ultra-nourishing cream infuses the skin with moisture. Natural antioxidants derived from blueberries and grape seeds reduce redness and prevent the formation of free radicals. Red clover, packed with plant estrogen, lifts the skin and restores its youthful appearance. Best for dehydrated, mature skin types. Perfect to restore moisture during travel. Ideal for sensitive or sensitized skin. Made in Switzerland. Blueberries (anthocyans, quercetin, resveratrol), jojoba, grape seeds (anthocyanidins, catechin, quercetin, resveratrol), red clover (isoflavone), vitamin E.
Best for dehydrated, mature skin types. Perfect to restore moisture during travel. Ideal for sensitive or sensitized skin. Smooth over cleansed face and neck twice daily. Best for dry to very dry skin types. Perfect to restore moisture during travel. Ideal for sensitive or sensitized skin, and for menopausal skin. As separation of natural ingredients may occur, mix before applying. Non comedogenic. Water/Aqua, Cetearyl Ethylhexanoate, Glycerin, C14-22 Alcohol, Simmondsia Chinensis (Jojoba) Seed Oil, Cetyl Alcohol, Hydroxyethyl Acrylate/Sodium Acryloyldimethyl Taurate Copolymer, Myristyl Lactate, Tocopheryl Acetate, Vaccinium Myrtillus (Bilberry) Fruit Extract, Vitis Vinifera (Grape) Seed Extract, Trifolium Pratense (Clover) Flower Extract, C12-20 Alkyl Glucoside, Squalane, Polysorbate 60, Polysorbate 20, Xanthan Gum, Chlorphenesin, Benzyl Alcohol, Benzoic Acid, Sorbic Acid, Fragrance/Parfum, Geraniol, Hexyl Cinnamal, Alpha Isomethyl Ionone, Amyl Cinnamal, Linalool, Butylphenyl Methylpropional, Citronellol, Limonene, Hydroxycitronellal.